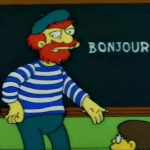 Anywai~, keep up the good work! 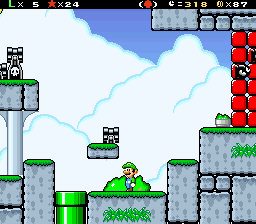 These rocky wall blocks can be destroyed with Bob-Omb explosions. 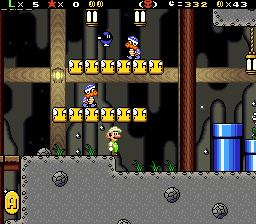 Sometimes, this is the only way to progress through the level. 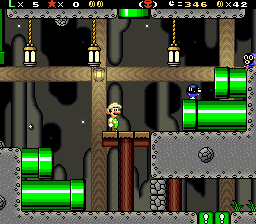 Fortunately, Bob-Omb-spawning pipes are always nearby. There must be something good on that lower route if I needed a Green Switch and an explosion to take it. 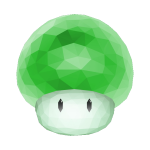 Bomb Bros. are also happy to supply you with Bob-Ombs, whether you want them or not. I'm considering live-streaming all future level-building sessions. I streamed this one, but it wasn't all done in one stream, and the first part was tacked on to the end of a Seiken Densetsu 3 session. Awesome game... but WHERE is the green switch? @karkar18: It's in Cola Secret 2. Sorry for the slow progress recently. I moved house a couple weeks ago and just got internet access on Wednesday. 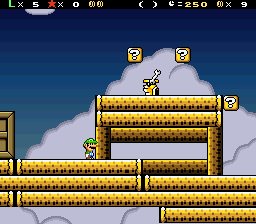 I was still able to get one level done in the meantime though. 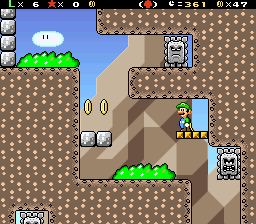 It's a vertical level full of Thwomps. They don't always travel vertically either. 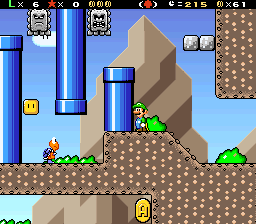 If a Thwomp-centered level just had the vanilla Thwomps, it could get boring, right? 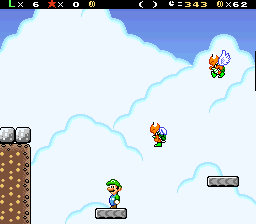 Of course, there are some other enemies here too. Wow Gamma, this is awesome. The OW horizon water is a bit odd because the ripply water doesn't line up to scale, given it's where the sea would meet the horizon. That would be flat, but the art style throughout is beautiful. I like the reworked vanilla look. I think I remember saying the dirt pattern looked to busy but now looking back its actually growing on me. Reminds me of Crunch Chocolate Bars if you have ever had one. 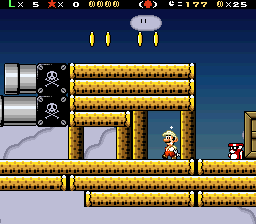 As for the level its always nice to throw in a Vertical level granted I know how wonky they be in certain aspects when building them. Once last thing I don't you if you have seen them but there are these custom Thwimp sprites that rotate around in a set pattern. 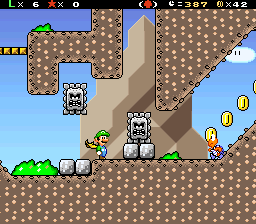 They could work well in a small sub-level or bonus room found in this level to tie in with the rest of Thwomps. Sorry it took so long to get back into this. 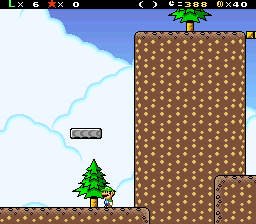 I don't know if it was the move, getting back into RPing, playing EarthBound for the first time, or Prozac Poop-Out that killed my motivation to work on this for a while, but I finally got another level done. 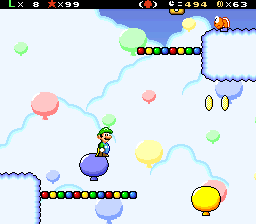 Like 7-1 from SMB: The Early Years, this level is centered around balloons. 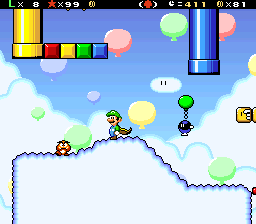 This time, though, much of the platforming takes place on rising balloons like these. Enemies will drop in on Baron Von Zeppelins. 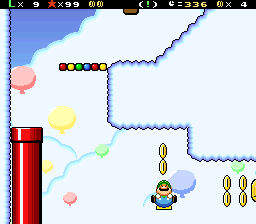 Riding a balloon into a pipe will lead into a bonus area where you can use a P-Balloon to get some sweet coinage! 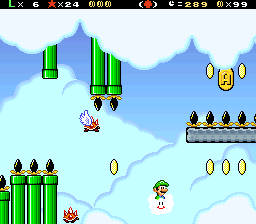 At first, I thought Big Luigi's ballooned sprite was glitched, but it turns out that those black things on either side of him are his feet. I hope it will be, FailSandwich. BTW, I love the EarthBound layout. Getting back on-topic, I just finished Cocoa Secret 4. 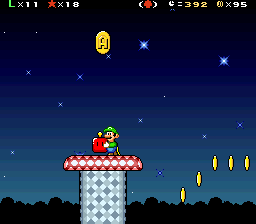 Yeah, Luigi can jump higher than Mario, but not high enough to get that A-Coin. That's where the Propeller Block comes in. 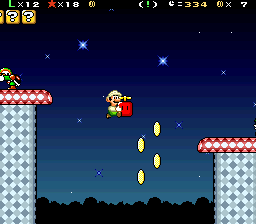 Not only do these blocks let you jump super-high when you hold them, they also let you descend a bit more slowly than you do with the cape. 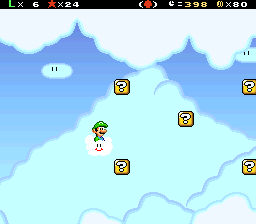 There are plenty of backup Propeller Blocks if you throw one off a cliff too soon. The only way to get this A-Coin is with the Propeller Block in hand. 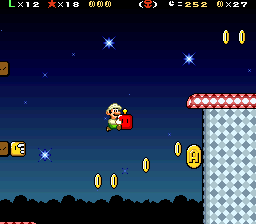 Amazing nighttime level you have here! Original, this was going to be a Ghost House, but, since I couldn't come up with a good gimmick idea, I decided to do an airhsip. This only looks easy because the cannons haven't fired yet. Red Rocky Wrenches throw smaller wrenches that move faster...aaand this one nailed me. 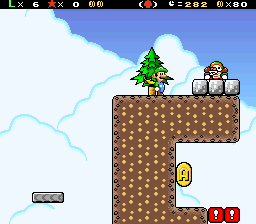 Nice use of the Hoohoo Mountain theme from Superstar Saga! But my level is a space themed airship level. Man this hack is already looking amazing!! keep up the good work gamma! Good idea but it's not really obvious you can pass through darkened logs (refer screenshot 1 and 2 of Cocoa Airship) . 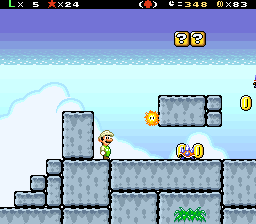 This level focuses on Boost Platforms, and the screens don't do it much justice. Here's a video. Yes, this is still going. 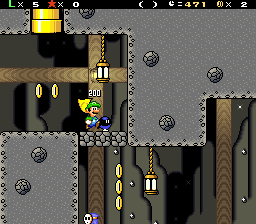 I'm almost done with World 6 now. 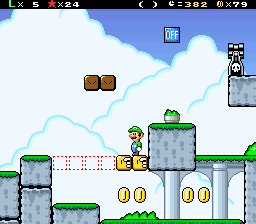 There's a pretty heavy emphasis on ON/OFF solid blocks in this level. 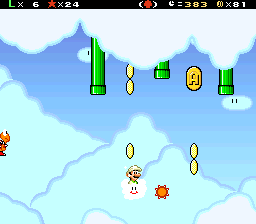 There are also times when you must travel through pipes to proceed, and...Wait...Am I upside-down? 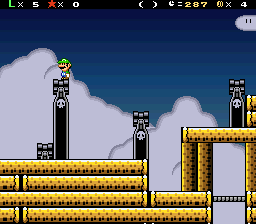 The biggest inspiration for the gimmick of this level is the Sky Garden from Illusion of Gaia. You'll often have to backtrack a little to find the switches. I should probably put another 100 seconds on the clock. 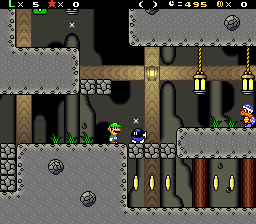 Even music you used in this level suggests that it's inspired by Illusion of Gaia. This concept sounds good, but I agree with someone from YouTube that ON/OFF really need something for emphasis as they're looking dull. If you do fix that, it'll be all right. Finally got some motivation to do another level. 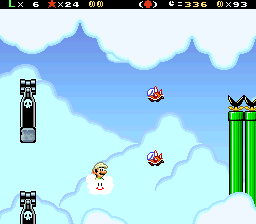 This level has you flying in a Lakitu cloud. At the beginning, it seems pretty chill. 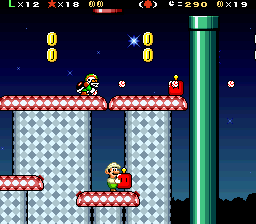 Then Spiny Eggs get dropped on you from skinny pipes like these. Some Spinies have learned to fly. Getting close to the end here.